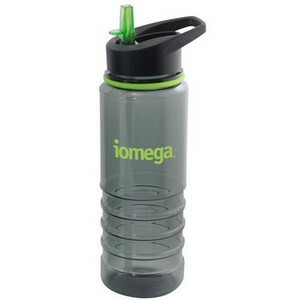 Tritan 25oz smoke colored sport bottle with flip straw lid. Spill free flip lid. Vibrant colored trim. Ridges in bottle for maximum grip. Easy carry lid. BPA Free. Hand wash is recommended. Imprinting Information: (One color only) Set-up charge $50 per location. Additional location run charge $.30. Re-order set-up charge $30 per location (Run charges apply).